Roasted cauliflower with coconut oil is a great way to prepare cauliflower. So many of us are looking for low carb or even paleo style eating options. If you have never tried cooking with coconut oil you will is it a great option when preparing your favorite dishes. I have been buying coconut oil for awhile and using it. You can read about the many benefits of using coconut oil. You might be asking yourself if what you cook still tastes like coconut oil. You can taste a bit of the coconut taste in the food that you cook, but what you do not get is the sweet taste of a coconut macaroon. Coconut oil can be swapped in place of olive oil or another type of vegetable oil. Some of the benefits of coconut oil is that you can cook with it at high temperatures. It is believed to help with weight loss, diabetes, and is even said to help with thyroid functions. You can store it at room temperatures for several months without having to worry if it will go rancid. You can find this at many regular grocery stores, and at most health food stores. This side dish made with the coconut oil is easy to do. Did you know you can roast a whole head of cauliflower in about 30 minutes? It is so easy to do. A quick chop, drizzle with oil, and season, then slip it into the oven and you will have roasted cauliflower in no time. Roasting cauliflower with coconut oil is not only good for you, but it always tastes great. Preheat oven to 425 degrees. Place chopped cauliflower and sliced garlic into a bowl. Drizzle cauliflower with melted coconut oil and stir to coat the cauliflower with the melted coconut oil. Line a baking sheet with aluminum foil. 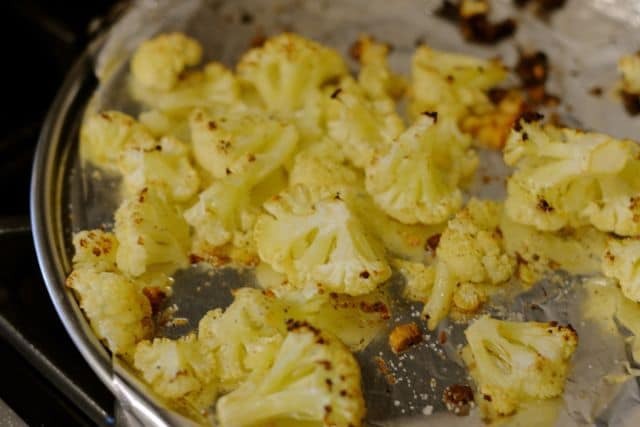 Place cauliflower onto foil-lined baking sheet. Roast cauliflower for about 25 to 30 minutes. Season to taste with salt and pepper before serving. Truffle salt is the best. I have cooked eggs in coconut oil. If you don’t mind the slight coconut taste, it is great. I put a teaspoon in my coffee instead of sugar, also in oatmill with flax powder chia seed walnuts and peanut butter and berries or other fruit cut up. Fry eggs in coconut oil. I make something simular,but I steam my califlower in the microwave then season with garlic salt & oregano. Add to preheated fry pan with about 1-2 T coconut oil. Stir fry til golden brown. Have even added precooked pasta for tasty meal!! Johanna, your recipe sounds wonderful! Also tastes delicious if you add a can of drained cannelloni beans! I there wasn’t enough flavor and I made the mistake on putting them on the bottom rack to cook, on side is almost burnt. But thanks for the recipe idea, I’m going to try the curry one next. These are great with curry! I love cauliflower any way it can be fixed, but my Hubs only likes it two ways; raw, in salads (it tastes just like cabbage and one day I’m going to chop some extra fine and put it in my cole slaw), and second, roasted as above using olive oil and curry powder. Those who don’t like roasted cauliflower may like it better with the heavier more pungent spices of curry. My absolute favorite cauliflower is battered and fried florets. It melts in your mouth. I bet those battered and fried florets are delicious. I will have to give this one a try sometime. Since you like it battered and fried, I suggest you try this delicious variation…steam a head of cauliflower and while it’s steaming, in a separate pan, brown plain breadcrumbs in butter. Pour breadcrumbs over cauliflower, cut into wedges and serve. It is AMAZING! It would be interesting to try this with coconut oil but of course adding a little salt. I just love the sound of this. I started buying coconut oil last year and haven’t used it nearly enough, but I’m guessing it adds just a little extra flavor in this recipe. It adds a little something. I don’t mind the flavor when I cook eggs in the morning. This is my year of learning to love cauliflower, and it’s not going too well. Roasting makes everything better, though, so I’m adding this to my list of recipes to try. I totally get not liking some vegetables. I personally hate green bell peppers. I would love to just flick them off of my plate whenever I see them, but that is rude 😉 I admire you are willing to give this a try. I hope this recipe helps. I too have vegetables I really dislike. I personally hate green bell peppers so I admire you for for trying to give something a try for a whole year. Try making your favorite potato salad, but substituting steamed cauliflower (crisp tender) for the potatoes, and adding cooked shrimp to the salad. I had this salad in The Netherlands, enjoyed it immensely, and make my own version at home.